I had absolutely no intention of starting another project until one of the current ones was completed. Then along came a Japanese bead embroidery class and, well, I had to start another project. 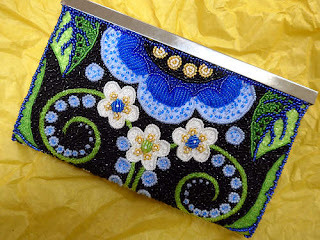 I really liked the project, was interested in learning some Japanese bead embroidery, and the class was being taught locally. How could I resist? Obviously, I couldn't resist, and I have a feeling that there are more than a few of you out there who have experienced the same problem! Allow me to introduce you to Wild Child. 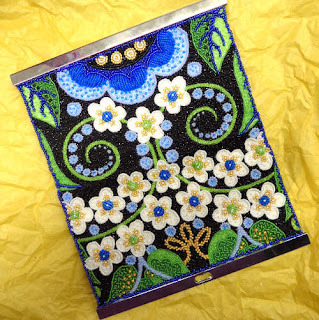 The project entails enhancing an exuberant quilt fabric ground with beads, lots and lots of beads! Wild Child is going to take a while. 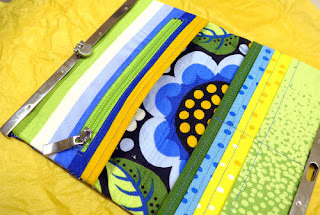 The fabric was designed by Jane Sassaman, and there are other variations and coordinating fabrics which are used on the interior of the wallet. 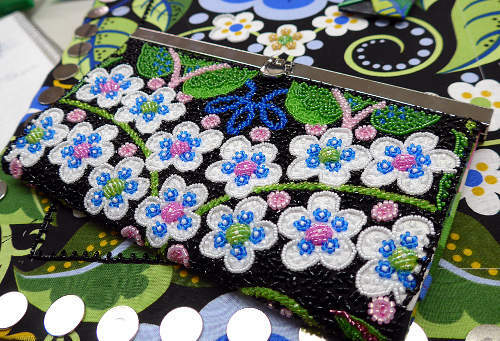 The 'diva wallet' part of the name refers to the actual design of the wallet. Instructions for the construction of the wallet from Sew Many Creations were included in the class kit. I'm stitching the blue version. There is also a pink version. It was difficult to choose between the two (for the class); I like them both. I didn't fully appreciate just how much of the wallet's surface is covered in beads until I saw it in person prior to the class. It is almost completely encrusted, including the black background. We started the embroidery with the black beaded border, which ideally is supposed to be fully stitched before you continue the project. However, this being a class, it was necessary to work on some other areas in order to learn various stitches and techniques. One of the most interesting things I learned in the class was how to use a koma to lay beads. It works incredibly well. The koma keeps tension on the string of beads while you couch them down and helps you to create smooth lines. Mary Alice designed a special beading koma, which are made by her husband. We were able to purchase them for the class. The next interesting thing was padding...with beads! 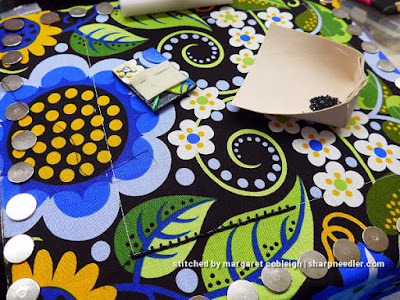 First you lay down a small circle of beads. 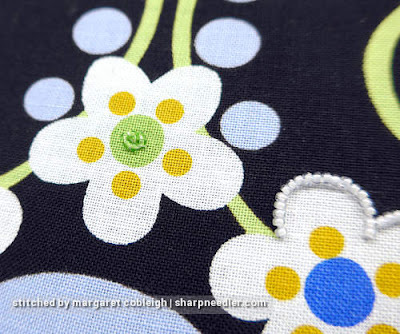 Then you essentially satin stitch over the top--with beads--to create a raised centre. That was fun! My brain thinks there is something weird about using beads for the padding, but it makes perfect sense given that this is bead embroidery. 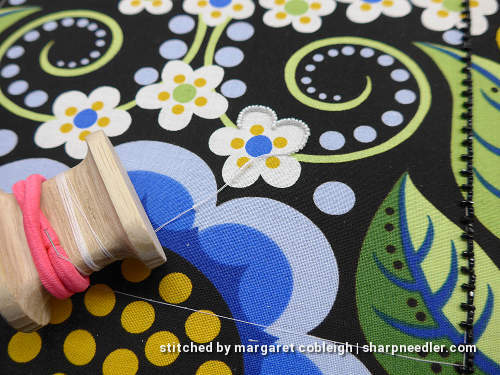 There were other stitches taught in the class. 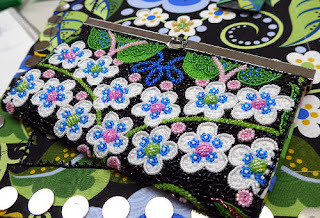 They seemed straightforward to me, so I decided to spend the second day of the two-day class finishing the border. It was necessary to complete the border in order to continue on with the project once class was over. Each side of the border took between 90 minutes and two hours to stitch, but I did get a bit faster as I went along. I get antsy when I have too many open projects. I don't like having more than about four (three is better). No more project starts until something finishes! This is beautiful. Would love to take this class. I highly recommend the class. Wow! Beautiful. Lots of patience to you. Good luck!!!! 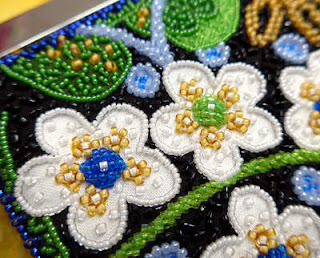 Taking a class with Mary Alice is on my list of things I want to do :) I took phase 1 of Japanese bead embroidery with the JEC and have been hooked ever since. It really is quite fun. I'm curious to know what is the difference between Mary Alice's komas and the more traditional one? Regarding the beading koma: as I understand it you traditionally take two small koma, tie them together, and then wind your string of beads over the pair of koma. Mary Alice's beading koma is a single wide koma which, I think, just makes things easier. It also seems to me that one koma would be more stable than two tied together. That does sound like Mary Alice's koma is more stable. I will have to see if I can get one. OH MY! This is awesome. Absolutely Beautiful. Yip, a lot of work, but! Understand about projects.... and toooo many open! It's a very cheerful piece to be working on. Learning how to use the koma for beading (and the beading koma itself) was worth the price of the class for me. This is brilliant! 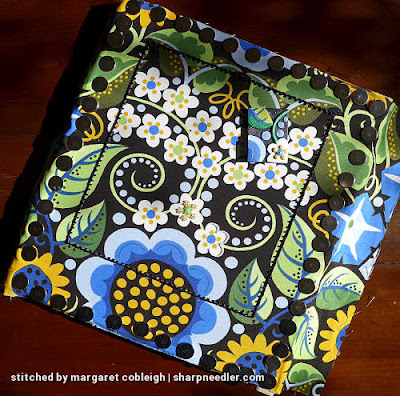 I have a beautiful patterned cotton fat quater. I might attempt something like this. I have Margaret Lee's book. And I am not afraid of experimenting :). But first, there are some projects that I do need to finish. Like you, I don't like to have many projects on the go at the same time. Thank you so much for sharing! 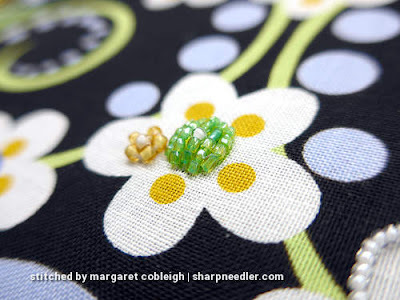 I keep looking at patterned fabrics thinking that they would be good candidates for bead embellishment. It's a dangerous thing to be thinking about! If I was doing this on my own (i.e., not having a class with a set project) I would start with something quite small. The instructions in Margaret Lee's book should be enough to get started. 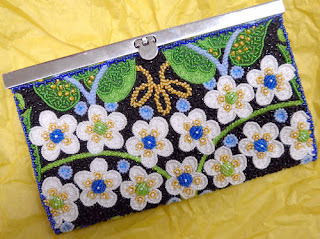 I also think I'd like to try a combination of embroidery and beading. I was working on 'Wild Child' today and I know that doing all of it in beads is going to drive me nuts!